One thing I have realized about myself through this blog is that I am not a fan of repetition. I always want to be doing, trying, cooking, or visiting something new. Originally this blog started as a place where I could document all the recipes I was making. So many times I would make something and it would be really good and then of course I would forget where I got the recipe from or just forget about it completely. The idea was that I would post them here and then be able to have them again, any time I wanted. The truth of the matter is that I still don't do that. Some people find comfort in have the same dish every Friday. After years of working in a field (outdoor education) where most of my food was prepared for me, I can tell you I will never eat Pizza on Thursday again. I yearned for my own kitchen during those years. Although some of the places I worked had great food, I still had a hard time with the monotony of a weekly schedule. The only routine we have is Pizza once a week, but it is never on the same day. One of the ways I have avoided cooking monotony is to join a variety of online cooking clubs. Unfortunately for one reason or another...too much baking, time commitment, or difficulty finding ingredients they have all fallen by the wayside. I have enjoyed being part of these online communities, but many never seemed like a good fit. When I heard they were starting a new Dorie Greenspan cooking club called French Fridays with Dorie I thought it sounded like fun. I had already ordered the book, and because it has a variety of side items, main dishes, and desserts it will ensure a more diverse experience. They also don't require you post every week to stay in "the club". This is the first recipe from the group. 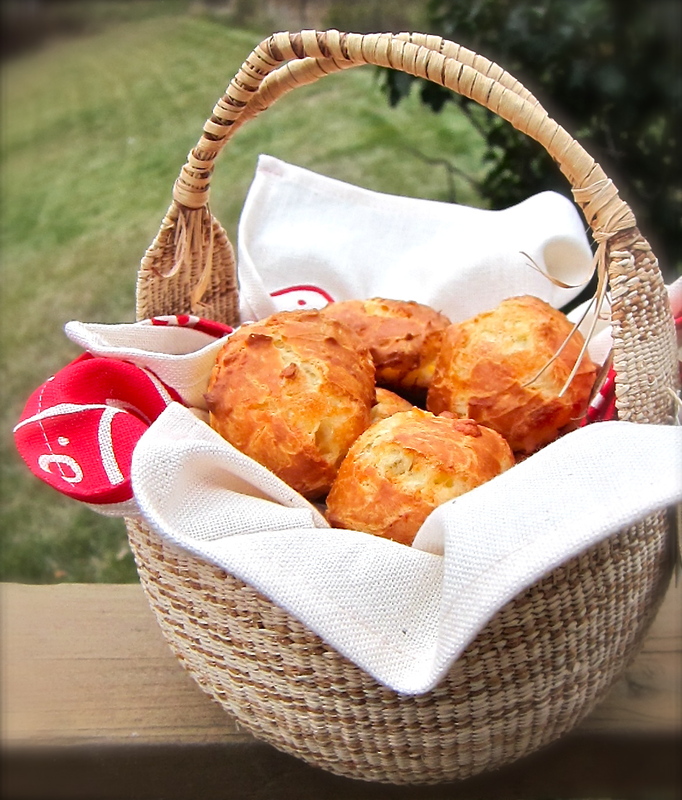 Gougeres are the first recipe in the book and I suppose as good a place as any to start. They remind me of a very rich popover. They are light and airy, yet still quite cheesy. These strike me as the kind of thing where the quality of the cheese would make a huge difference. I think they would be great with a Martini or cocktail, or even beer of your choice. I see them more as an appetizer, but I did have them with a light soup. I also followed the directions for freezing them and part of me feels like they are actually better that way. They seemed to puff up just a little more. The next time I will make them smaller, teaspoon sized. That way we can pull them out for a before dinner snack. After October I will not be sharing the recipes as they would prefer not to have every recipe from the book posted online, therefore encouraging people to buy the book. To encourage people to participate they are posting the first months worth of recipes.So I too will share them here with you. the mounds. Slide the baking sheets into the oven and immediately turn the oven temperature down to 375 degrees F. Bake for 12 minutes, then rotate the pans from front to back and top to bottom. 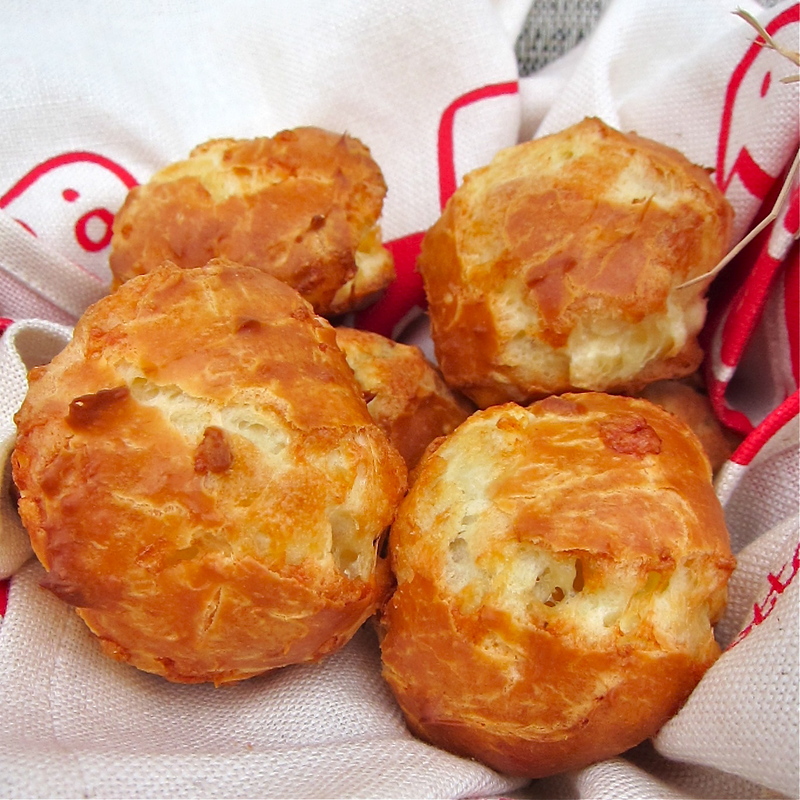 Continue baking until the gougères are golden, firm, and, yes, puffed, another 12 to 15 minutes or so. Serve warm, or transfer the pans to racks to cool. 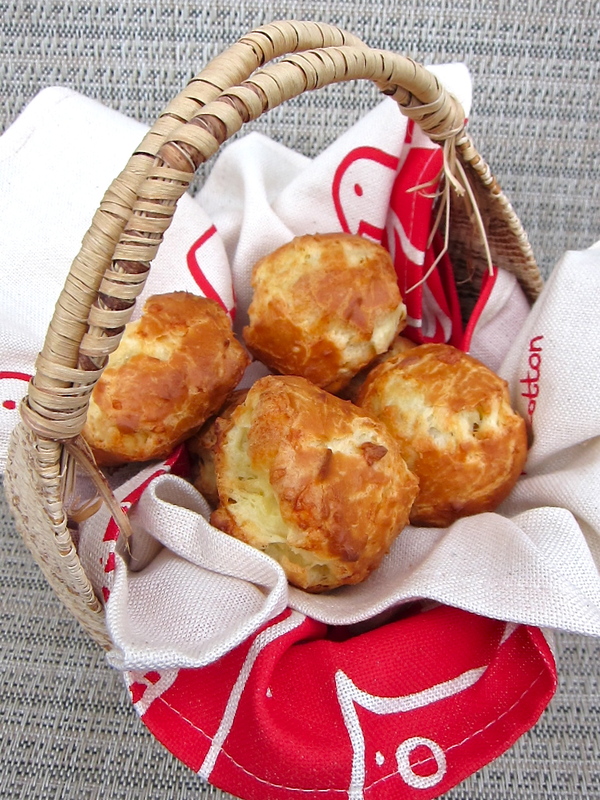 For freezing: The best way to store gougères is to shape the dough, freeze the mounds on a baking sheet, and then, when they’re solid, lift them off the sheet and pack them airtight in plastic bags. Bake them straight from the freezer — no need to defrost — just give them a minute or two more in the oven. The most beautiful gougeres I've ever seen!! Pate choux has always been my kitchen Waterloo, but your pictures have inspired me to try it one more time - the gougeres look so gorgeous that maybe, just maybe, this recipe will be the one that succeed in breaking the curse. I wonder, have you baked them straight from the freezer and does that work?? or is that just in Dorie's recipe? It sounds like a good trick if it works for having nice treats on hand for drop-ins. Laurie- I have actually never made Pate Choux before. I always heard how hard it was. This recipe seemed super easy to me. Yes, I have baked them straight from the freezer, the ones in this photo are the freezer ones. By the time I get home from work, let the eggs warm up and then make the Gougeres it is too dark to take any photos. So, I took these from the freezer ones the next day. I actually thought they were better. The only difference I notices was that they seemed to darken up quicker, rather than take longer as suggested in the recipe. They turned out beautifully. Great photos! Wow- That picture of the inside is fantastic! I think that FFwD is going to be full of variety, which will be fun. I am in love with the cookbook and read it daily. I love Dorie's combination of classic recipes as well as new cuisine. P.S. The sharp cheddar that I used worked great. Though I would love to use a wonderful cheese, I would definitely use the sharp cheddar again in a pinch. Gorgeous pictures! I am with you about losing interest unless I am cooking or baking something new and exciting. Your gougeres looks perfect in their golden brown shell. I love your photo of the insides! I found these to be delicious with a little bit of bacon tucked inside. Yours are so perfectly browned - beautiful pictures! Just found your blog and have enjoyed reading your posts...we're distant baking buddies through Dorie and FFWD. I too made the gougeres and posted photos. They are delicious. Met Dorie at her cooking class here in Austin. She's lovely. If you're still looking for a scone recipe please give my chocolate chip scone a try. Alaska sounds wonderful...and cold...something we rarely experience in Texas.